The Margarita Studio DeLuxe lies on the Flamingo Resort Coral Estate, and is suited for two adults and two children under 12 years. 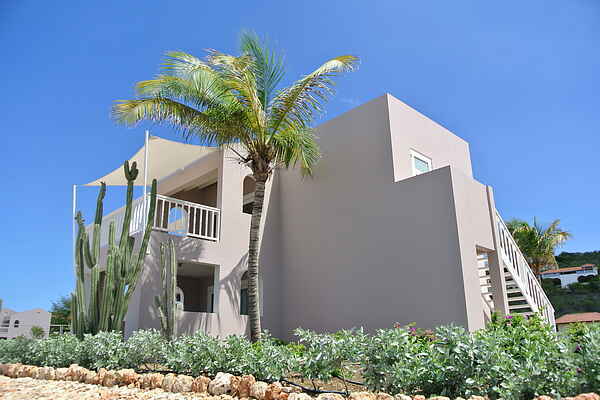 Enjoy a terrific holiday in this comfortable studio overlooking the azure Caribbean Sea. These studios are comparable to the Blue Curaçao Studio's DeLuxe, but they have an extra sofa bed in addition to the double boxspring bed. The Margarita Studio Deluxes are characterized by a luxurious and comfortable interior. Every studio has its own balcony or terrace. The swimming pool is closed until April 1st, 2016. Willemstad is the capital of Curaçao. The city district encompasses multiple neighbourhoods, of which Punda and Otrabanda have always been the most important districts. The eastern wharf of Sint Anna Bay is lined with façades characteristic of Old Dutch architecture. Because, according to Caribbean standard practice, these are painted in vibrant colors, a stunning row of façades was created that, individually or altogether, make for an excellent photograph. Behind the Harbour is the shopping district of the city.